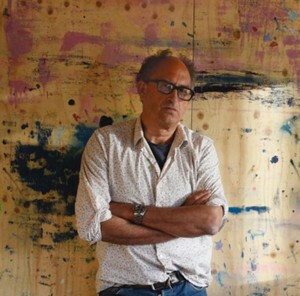 Tom Hammick (b.1963) is a British artist based in East Sussex and London. Moved by the minutiae in life, he reflects on man’s place in the world. With an emotive handling of colour, Hammick creates psychologically charged spaces in which figures, alone or in groups, are cast adrift. Recurring motifs of isolated human dwellings (forest cabins, modernist houses, studios or compounds) appear to withhold an internal drama behind their flattened planes. The suggestion of a hidden narrative is palpable; that by excluding the viewer from the action, they might discover the truth of its meaning. While linked to a romantic tradition, searching for poetic meaning through the awe-inspiring power of nature, Hammick’s work shares sensibilities with contemporary narrative forms, summoning the uneasy atmosphere of a crime thriller, or a dystopian suburban nightmare. Tom is a Senior Lecturer in Fine Art, Painting and Printmaking at the University of Brighton and Visiting Lecturer Fine Art University of Ulster and Nova Scotia College of Art and Design (NSCAD University). He has work in many major public and corporate collections including the British Museum (Collection of Prints and Drawings), Victoria and Albert Museum, Bibliotheque Nationale de France (Collection of Prints and Drawings), Deutsche Bank, Yale Centre for British Art, and The Library of Congress, Washington DC.